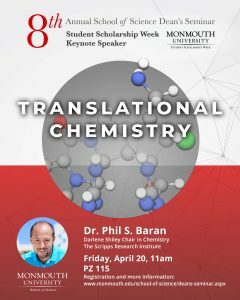 Dr. Phil S. Baran, the Darlene Shiley Chair in Chemistry at The Scripps Research Institute, will present his talk on Translational Chemistry at the 2018 School of Science Dean’s Seminar on Friday, April 20 at 11 a.m. in Pozycki Hall, Room 115. School of Science Dean Steven M. Bachrach will host this event as part of Student Scholarship Week. Phil Baran was born in 1977 in Denville, New Jersey. He received his B.S. 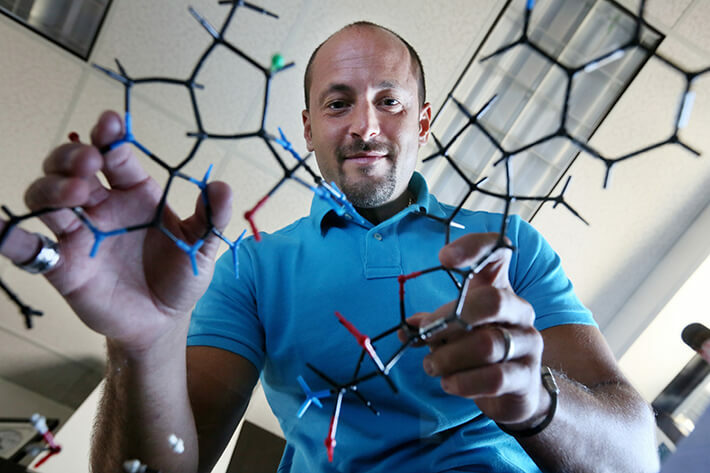 in chemistry from NYU in 1997, his Ph.D. at The Scripps Research Institute in 2001, and from 2001-2003 he was an NIH-postdoctoral fellow at Harvard. His independent career began at Scripps in the summer of 2003. He currently holds the Darlene Shiley Chair in Chemistry. Phil has published over 180 scientific articles and has been the recipient of several ACS awards such as the Corey (2015), Pure Chemistry (2010), Fresenius (2006), and Nobel Laureate Signature (2003), and several international distinctions such as the Hirata Gold Medal and Mukaiyama Prize (Japan), the RSC award in Synthesis (UK), and the Sackler Prize (Israel). In 2013 he was named a MacArthur Foundation Fellow, in 2015 he was elected to the American Academy of Arts and Sciences, in 2016 he was awarded the Blavatnik National Award, and in 2017, he was elected to the National Academy of Sciences, USA. He has delivered hundreds of lectures around the world and consults for numerous companies such as Bristol-Myers Squibb (since late 2005), Boehringer-Ingelheim, AstraZeneca, DuPont and TEVA, and is a scientific advisory board member for Eisai, Abide, and AsymChem. In 2016 he was appointed as an Associate Editor for the Journal of the American Chemical Society. He co-founded Sirenas Marine Discovery (2012) and Vividion Therapeutics (2016) and in 2013 he co-authored The Portable Chemist’s Consultant, an interactive book published on the iBooks store along with his graduate class in Heterocyclic Chemistry (viewable for free by anyone on iTunes University). Outside of the lab, Phil enjoys spending time with his wife Ana and three young children (Lucia, Leah, and Manuel).